“Saturday Night Live in the 2000s: Time and Again” TV review – Tina Fey, Alec Baldwin Jimmy Fallon, Amy Poehler, Andy Samberg, Lorne Michaels, Kristen Wiig and Justin Timberlake n the “Saturday Night Live in the 2000s: Time and Again” TV review. This provocative and bloated documentary remembers a decade characterized by some of the biggest changes in American history, with Saturday Night Live both reflecting and creating those changes. 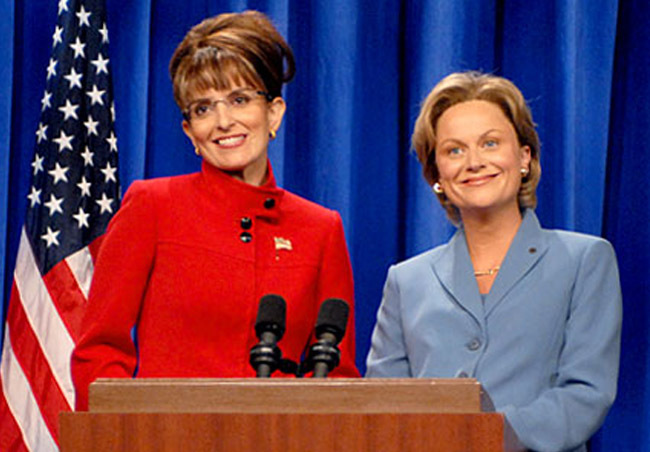 Generating some of the biggest stars in the show’s history, including Will Ferrell and Tina Fey, the cast throughout the 2000s broke new ground, targeted new ideologies and rode the wave in the extreme insanity of the times. From the first blush of the new millennium, when 1990s cast members – Molly Shannon, Tim Meadows, Cheri Oteri – were transitioning to new faces like Jimmy Fallon, Tina Fey, Amy Poehler and Andy Samberg, SNL as show had to transform with them. In general the recurring characters (Kristen Wiig exception) took more of a back seat to a more ensemble feel, as emphasized in the some the early sketches featuring the now familiar performers. Within that interchange lies the beauty of the documentary approach in this overview. By truncating their most famous and funny sketches of the decade, the special avoids that particular quirk that SNL practices too often – the sketch that either won’t end or has no thesis. This basic comic rule (always leave them wanting more) is violated mostly and perplexingly in their opening bits. But there is none of the that with this self-congratulatory celebration, and in essence it can be argued that SNL had a very strong decade, almost second to the 1970s (which was second to none). There were incredible challenges – the 2000 hanging-chad election, the post September 11th atmosphere, the Bush years and the historical race of 2008, with Hillary, Barack and of course Sarah. In the background of taking on these millennial touch points is the new technology. SNL was actually YouTube before YouTube, their short sketches primed to be enjoyed on a iPhone screen on a commute. It is argued in the special that “Lazy Sunday,” the Andy Samberg and Chris Parnell rap that increased the YouTube traffic accordingly, was the first viral phenomenon that launched the sea change. The assertion totally makes sense, with a “D*ck in a Box” included. ”Saturday Night Live In the 2000s: Time and Again,” a two hour NBC-TV special, airs on April 15th, 9pm ET/8pm Central Time. Check local listings for channel locations. Featuring Tina Fey, Alec Baldwin Jimmy Fallon, Darrell Hammond, Tracy Morgan, Chris Parnell, Horatio Sanz, Rachel Dratch, Maya Rudolph, Amy Poehler, Andy Samberg, Seth Meyers, Fred Armisen, Lorne Michaels, Will Forte, Kenan Thompson, Jason Sedeikis, Kristen Wiig, Justin Timberlake and Bill Hader.